Smaller, stronger, just as fun! 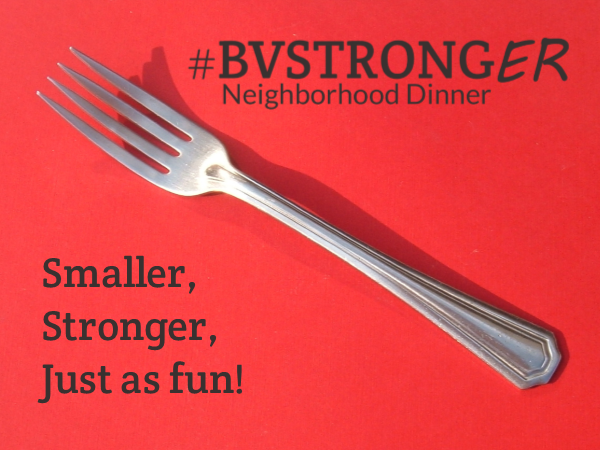 Continue the spirit and strength of the BV Strong Community Dinner with a Neighborhood Dinner right where you live! More than most communities, Buena Vista knows there’s magic in this meal. Let’s make BV even STRONG-ER! Enlist as many neighbors as possible to help with the event. Someone can print the invitation; others can help pass them out. One neighbor can host, others can help with food. Print this free invitation to explain what your BV Strong-er Neighborhood Dinner is about, encourage attendance, and perhaps ask guests to bring a dish. Use natural neighborhood boundaries where possible (i.e. end of the block). Invite every home within that area. Decide if this will be a neighborhood dinner restricted to those on the street/block or whether people can invite friends/relatives (if yes, how many). Get creative with the type of dinner that will work best in your neighborhood! Keep it simple and share the work. If you live in BV and want to inquire about closing down a street or redirecting traffic, or having your Neighborhood Dinner in a local park or at the Community Center, please contact Parks & Rec at 719-395-2408 or visit www.buenavistarec.com. Remember that public sites need to be cleaned and left in good condition. The BV Police Department or Chafee County Sheriff are pleased to send an available officer to your Neighborhood Dinner to share any specific concerns in your neighborhood and tips on improving neighborhood safety. Pass out invitations 3-4 weeks before your Neighborhood Dinner. Any time of year is perfect! Consider football parties, Christmas caroling, summer cookouts, as well as indoor celebrations. Saturday afternoons, Sunday brunch and weeknights are all good options! End early on a school night so neighborhood kids get enough sleep. Help elderly neighbors with transportation if your dinner is after dark. Print this free invitation and pass them out to your neighbors by going door to door. This adds a personal touch and people often offer to help. A casual approach can be used to inform neighbors as you see them out working in their yards. Call neighbors on the phone. (TIP: look up your listing using the Reverse Address feature at www.whitepages.com, then click your neighbors’ listings). Make an extra effort to get your new neighbors out to the event. To reach neighbors in townhouses, apartments and condos, approach the manager. They will let you know how to get in touch with the residents. Make decisions about the set up. Introduce new neighbors and help them make connections. Make sure the cleanup is done. Have a guest book to help develop a contact list for the neighborhood. Name tags can be a great help. Set up tables for food and have a few garbage cans available. Decide whether you will provide or ask neighbors to bring items such as tables, chairs, plates, silverware, cups, beverages, BBQ grills, etc. Decide if pets are allowed. Be ready to oversee the clean up after the event. Visit and eat! Just like BV Strong, you and your neighbors can share food and friendship as you celebrate and nurture a sense of community. Games for kids (some organized, some they can play themselves). Take time to introduce one another, or plan icebreakers to learn neighbors’ names. Encourage the talent in your neighborhood to come forward such as musicians, magicians, etc. We’re here to help! Contact Amy Lively at (740) 654-5423 or info@bvstrong.com. Post updates about your BV Strong-er Neighborhood Dinner at our Facebook group, www.facebook.com/groups/bvstrong. Be one of the first five people to register your BV Strong-er Neighborhood Dinner, and you’ll win free pre-printed custom invitations to pass out to your neighbors! We’ll fill in the Host information, date, time and location and have them printed locally for you to pick up. You can also download a free invitation template HERE to fill out yourself.